In the file explorer, other than using your mouse to navigate between folders, you can also directly enter the folder paths in the address. This is particularly useful for deep buried but known folders. Though good, for ease of use, file explorer keeps tracks of all that address bar activity history. When you need, you can use the dropdown menu to select the folder. If you don't like file explorer tracking and listing your address bar history then you can delete those entries. Here's how to clear file explorer address bar history in Windows 10. 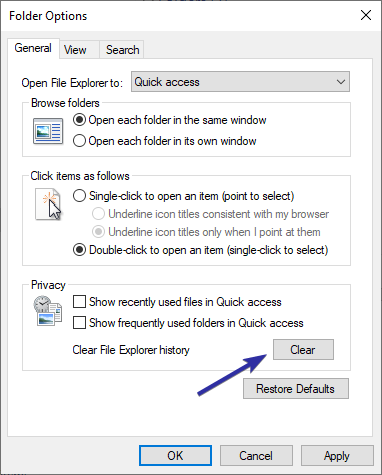 The easiest way to clear address bar history is to use the quick and easy file explorer right click option. With just a couple of clicks, Windows will clear the file explorer's address bar history. First, open file explorer by clicking on the taskbar icon or by pressing the Win + I keyboard shortcut. In the file explorer, right-click on the address bar and select "Delete History" option. As soon as you select the option, Windows will delete the address bar history. As an alternative, you can also use the folder options tool to clear file explorer address bar history. One of the advantages of this method is that you can clear the quick access activity history too. In the file explorer, click on the "View" tab appearing the top bar. In the View tab, click on the "Options" button. The above action will open the Folder Options window. Here, click on the "Clear" button. As soon as you click on the clear button, Windows Explorer will delete address bar history. If you want to, you can also stop file explorer from tracking your folder and file activity too. To do that, uncheck both the checkboxes under the Privacy section and click on the "Ok" button. If the above two methods did not work for some reason, you can try editing the registry to clear windows explorer address bar. You see, all the history items in the file explorer are stored as an individual value within the registry editor. By deleting those values, you can delete the file explorer address bar history. Also, since the history items are stored as individual values, you can delete specific keys to clear specific items from the address bar history. For instance, maybe you don't want a specific folder address to appear in the address bar history. In those situations, deleting specific registry value will get the job done. For this specific purpose, though editing registry is fairly easy, I'd recommend you back up the registry so that you can restore in case of any mishaps. Open the Run dialog box using Win + R, type regedit and click on the "Ok" button to open the Windows Registry Editor. In the editor, copy and paste the below path in the address bar and press Enter. This action will take you to the target folder where the file explorer history values are stored. On the right panel, you will see multiple values like url1, url2, etc. To delete a single entry from the file explorer history, right-click on the target value and select the "Delete" option. You will see a warning message. Simply click on the "Yes" button to continue. 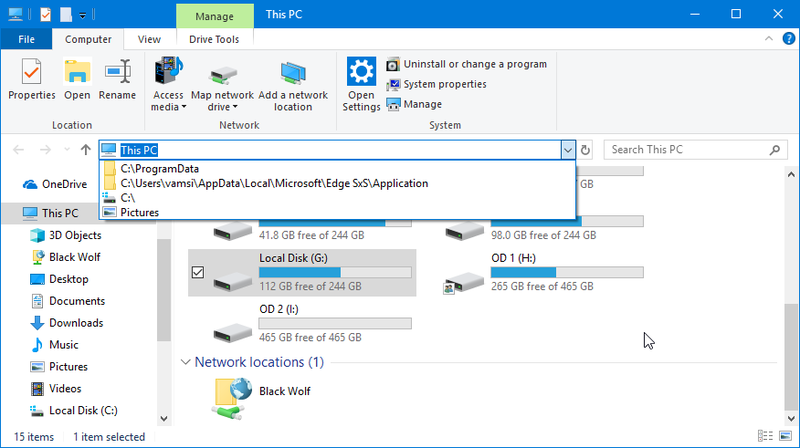 To clear the entire file explorer history, select all the values except "Default", right-click and select the "Delete" option. Close and reopen the file explorer and the file explorer's address bar history will be cleard automatiaclly. That is all. It is that simple to clear address bar history in file explorer. If you like this article, do check out how to clear recent color history and how to install new fonts in Windows 10.